Kensington High Street is smart. There is the usual complement of restaurants in the area and they range from the expected Lebanese to the trendy European casual restaurants; but this is a wealthy neighbourhood so there are eateries here that might demand a second mortgage. One would expect to pay a premium for a meal in such a swep-up neighbourhood, but there is a spot that will likely surprise visitors like Sticky Fingers! Perhaps you have to be over a ‘certain age’ for the name Bill Wyman to mean much. But for those of us who are, we know him as the bassist for the Rolling Stones and everyone surely knows who they are/were. He now scores music for films and the like, but a new generation might know him better as a restaurant owner. Sticky Fingers Restaurant is just off Kensington High Street and is aptly named after the eponymous album by the Stones. Their own sticky fingers will probably be in the near future of most diners here. There are quite a few dishes on the menu that will be best tackled with digits rather than silverware. This is an American-themed restaurant with a focus on ribs, burgers and some rather fine steaks. There is a motorbike in the window which around this time of year sports a Father Christmas! There are red-upholstered booths which seem to be the most popular tables in the place. Might be a good idea to book if one wants one of those, but this is such a popular spot that it’s probably wise to book for any visit. There is plenty of Stones memorabilia. Guitars even feature as door furniture. Having said that, I found Sticky Fingers to have rather tasteful décor. This and the music act as more of a reminder than an overly retro smack in the face. In 1989 Bill Wyman opened just the kind of restaurant he most liked to eat in, and it works today for its loyal following. Sticky Fingers is tucked away on a side street but it’s an iconic establishment that woos the discerning away from the likes of The Hard Rock Café. I am not sure if there are ever similar queues here but this is Kensington so there might even be bylaws preventing such unseemly gatherings. It is evidently a restaurant with cachet and history and that might be enough to elicit a first visit, but the menu will ensure many happy returns. The food was good. In fact it was very good. We started with cocktails and they were traditional and sizable. A Margarita was my guest’s choice – Sauza Hacienda tequila, fresh lime juice and Triple Sec served on the rocks. He isn’t a man to be easily impressed by mixed drinks but he was tempted by a second glass. Nothing frilly or posey. This was a proper adult cocktail. My Mojito – fresh mint, lime wedges crushed with brown sugar and Brugal Añejo rum, topped with crushed ice and soda – was served in a tall glass and was correct in every way. We arrived early in the evening so those drinks were a remarkably reasonable £4 or so, reduced from an equally striking £7 at full price! We shared a plate of Rice Balls as a starter and that was a substantial serving of pea, sweet corn and Monterey Jack cheese rice balls, with smoked chilli aioli on the side. I think these could be presented in a larger serving as a vegetarian main course. They were moreish. 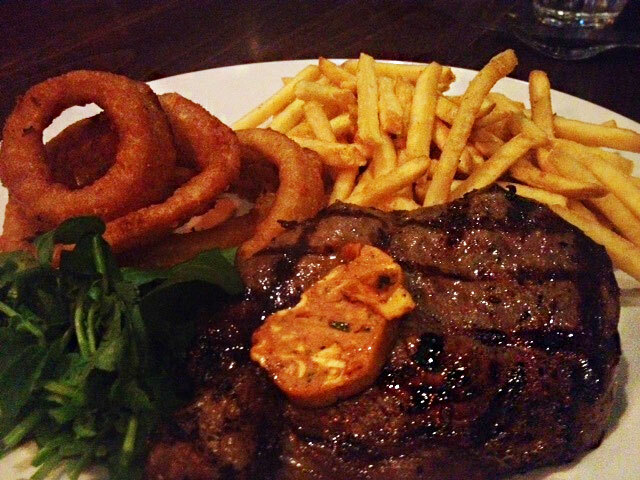 An 8oz sirloin steak with fries, onion rings and Cajun butter was the big event for me. I ordered the steak to be medium rare and it was indeed just that. The meat was moist, pink and flavourful. This isn’t a dedicated steak restaurant, more of a burger and rib bistro, and this was one of the best steaks I have enjoyed in ages …even during my recent trip to the US. Nothing fancy but perfectly cooked with old-fashioned sides. But what of those celebrated ribs? My guest ordered a half-rack of baby back ribs and sweet potato fries, and even that diminutive portion was a good size. One would have to have a lorry-driver’s appetite to have three courses with a full rack here, but it was also the quality of these ribs that made them noteworthy. The ribs were so well barbecued that the bones were clean and white on the side of the plate at the end of the feast. The glaze was sweet and mildly spiced and, unsurprisingly, sticky. Apple pie with a delicate crust was the finale. It’s typically American and a fitting end to a great meal that did exactly what it said on the tin. 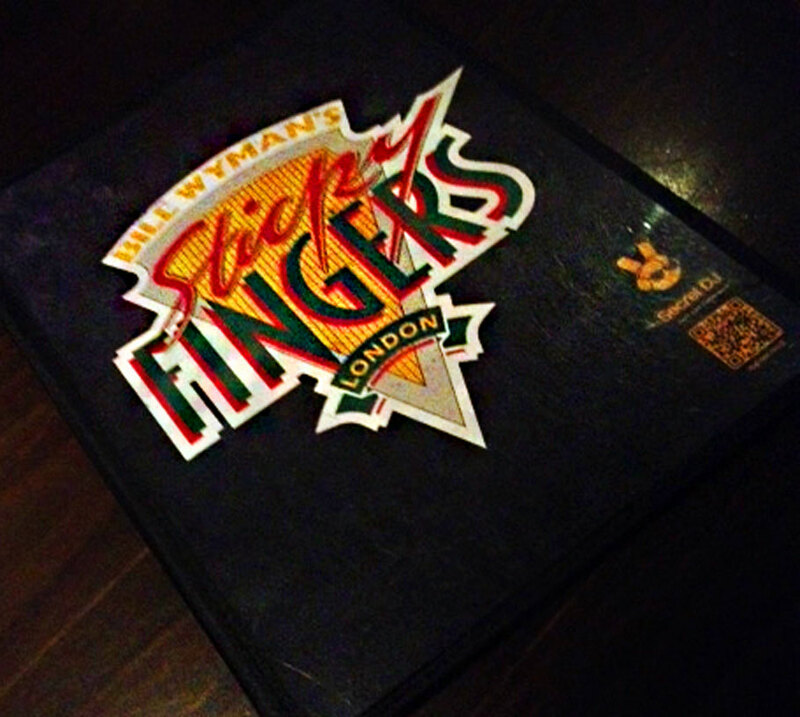 Bill Wyman is thoroughly British but his company has hit the right note with this American-esque culinary Sticky Fingers. The prices for both food and drink are surprisingly accessible and the ambiance encourages good times. I’ll return to try the fried Catfish …and another cocktail.